Retirement! We all know that the time will come when we all look forward to our retirement, but suddenly as retirement approaches we have the opportunity to reflect on the career that we chose, the people we have met, and the challenges that we have had. That became a reality for me in September 2013. When I look back on a 40-year career in court reporting I think about the changes in our profession that were never imagined in 1972 when I graduated from Kenosha Technical Institute (KTI) – realtime, streaming, broadcast captioning, captioning for students at colleges and universities, and even church services – and how fast reporters had to embrace technology whether we wanted to or not. 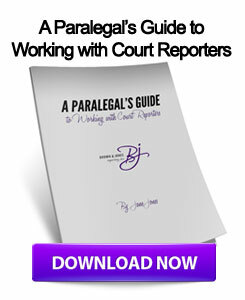 Change was something that was discussed by my instructor, Mr. Stein, and that change was the new technology of electronic recording in courtrooms and that there would eventually be no need for court reporters. As a 21-year old student I remember thinking why am I studying and paying tuition for a profession that will be obsolete as I am about to graduate. During my 40-year career I have worked as a reporter for a federal law enforcement agency, as a per diem reporter at the Milwaukee County Courthouse, and in 1976 I became a freelance reporter, first with Bonk Reporting, and since May of 1988 with Brown & Jones Reporting. A highlight of my 25-year career with Brown & Jones is that I had the opportunity to travel to many cities throughout the United States for depositions, and a dream assignment – 12 days in Milan, Italy. I have had enormous opportunities to report both in court, Grand Jury proceedings, arbitrations, municipal hearings, and in depositions, many interesting cases, and have had the opportunity through those cases to meet the best and brightest lawyers not only in the State of Wisconsin, but lawyers throughout the United States that came to Milwaukee for depositions, and also experts in many disciplines: medicine, engineering, pharmaceuticals, manufacturing, business, that have authored textbooks or chapters of textbooks that are recognized throughout the country. What I really loved about freelance reporting was the fact that when you went to a law firm, doctor’s office, a business, every day was a different, unique set of circumstances from the witnesses that were deposed in personal injury cases, product liability cases, business deals that went bad, divorce, and the events that led up to their particular situation. Sometimes I found it extremely uncomfortable to listen to such intimately personal details. As I look back over the last 40 years I am just astonished as I think about the change in technology that I have experienced first-hand. The advent of computers to prepare transcripts was a huge change, because no one knew anything about computers, and this was the first leap into technology – observing first-hand the evolution of computers and what they could do – from the large Stenograph Cimarron system, to Premier Power, to Case Catalyst, and especially the advent of the ability to synchronize the audio of proceedings to the text on the screen. The most dramatic change was to a reporter’s fundamental piece of equipment – the writer – first with the electric writer with a cassette inserted, to the Smart Writer, the Elan Mira writers, and currently the Diamante writer with built-in WiFi and AudioSync, and even Brief-It to provide suggested brief forms. Looking back on 40 years of reporting, back in 1972, Mr. Stein was correct. The future of electronic recording has become a reality in many courtrooms, unfortunately, but I wish he were alive to see what change has produced in the court reporting profession that not even he could have imagined. I am adjusting to retirement very well. Time to spend with my elderly parents, spoiling my nephews Jimmy and Michael, and traveling with my husband Neil. We hit the slopes in Utah in January, in March driving to Florida and making various stops along the way before beginning our Caribbean cruise; and on our return, driving along the east coast of the U.S., visiting Neil’s sisters in Lexington, Kentucky, before heading back to Wisconsin. I will be thinking of my co-workers at Brown & Jones, as I enjoy my retirement!